Four Trade Show Marketing Trends that will make your booth stand out! Trade show marketing continues to benefit from updating display designs but is increasingly leveraging the power of the digital age. 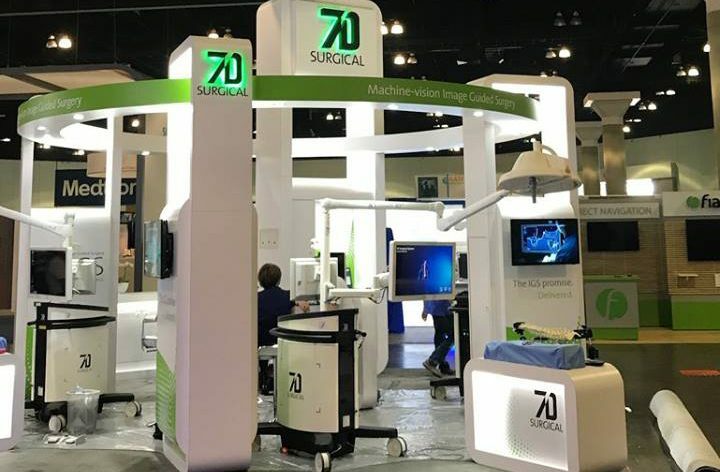 Certainly, contemporary eye-catching designs can pull in more floor traffic, but how you most effectively engage booth traffic continues to change. Having conversations and exchanging business cards remains valuable; however, utilizing digital business tools is the smart way to go. This article introduces four trends used by smart trade show marketing teams to maximize results. In today’s trade show world, it seems as if trade show booths with unconventional design techniques are the most eye-catching. More and more marketers and sales teams are starting to realize this. In a crowded exhibit hall where you are shoulder to shoulder with your own competitors, how do you stand out to your potential clients? Improving your display design (visual appeal) is extremely important. Plenty of businesses are starting to think unconventionally when it comes to booth design. We are starting to see a lot more sleek and slim displays. Sleeker trade show display designs are preferred by your consumers and manufacturers, with your displays being slim and gracefully fitting into their surroundings. Aside from appearance, consumers and manufacturers are also looking for things like size and usability. Display technology has made leaps and bounds in the last twenty years. Today it seems like most signage is now replaced by a digital screen or some sort of interactive technology. All trends in electronic display technology are focused on what is cutting edge. Today, there seems to be more & more hype surrounding virtual and augmented reality than ever before. These technologies are paving the way for innovation in the trade show display industry for years to come. Expect to see the reality of trade shows change for the better in 2018, as more brands incorporate this virtual and augmented reality into their displays. Social media marketing has been and will continue to be a very important resource for trade shows in 2018. Social media platforms including LinkedIn, Facebook, Twitter, and Instagram are all great platforms to publicize your appearance at the trade show. This is usually part of a strategic plan that begins several weeks before the start of the show. This component of trade show marketing is used to strengthen brand recognition and reach potential event visitors. This is beneficial so clients know exactly where to find your booth and what you have to offer them. Most trade shows or expos promote themselves on social media with their own hashtag. T\As an exhibiting company, you are able to include that hashtag in your posts. Others who are attending the show and view the show hashtag will see all your posts regarding your actions and whereabouts at the trade show. Additionally, if you are showcasing new technology or products, having all social media materials including graphics, videos, and other content will allow you to post to your pages in real time as you unveil new products. Have all this material ready to go prior to the show. Social Media platforms are a great tool for posting and keeping followers informed pre-show, during an event and post-show. Connecting online with anyone you’ve met during the show is a great way to engage with potential leads. Social media platforms enable companies to reach prospects before, during and after an event. There is a multitude of different apps that can be helpful in your lead generation efforts when you are at the trade show. The following applications are just a few that we thought were very important for making the most of your trade show efforts. These apps can be downloaded from either Google Play or the App Store (Apple). Leadature. Leadature is a lead-capture software designed for trade shows and conferences, this app can capture and rank leads, electronically distribute collateral, and accelerate leads through the sales pipeline while offering real-time data measurement. Leadature can be used on PCs, tablets, and smartphones – with or without an Internet connection – and works with all badge types as long as the data is not encrypted. CDS Xpress Connect. CDS Xpress Connect providing you with a way to make timely follow-ups, which is often a key to success with tradeshow contacts. CDS Xpress Connect lets you scan or type badge IDs to capture lead details and have prospects answer preliminary qualifier questions. You can also use the app to rate your leads, schedule appointments forward leads to coworkers, and send follow-up emails to prospects and customers. CamCard. CamCard enables you to digitally gather business cards at exhibitions is critical for generating leads. For just $0.99, CamCardmakes it easy to organize and store them by allowing you to take pictures of business cards and save the images to your smartphone. The app also enables you to edit the data and add custom fields and reference notes to capture all the information you need.